Hunt the Boeing-- WTC2 Edition: Hunt the Boeing III: WTC2 Edition! Hunt the Boeing III: WTC2 Edition! This is a Boeing 767-200. It has a wingspan of 156 feet and is 159 feet long. 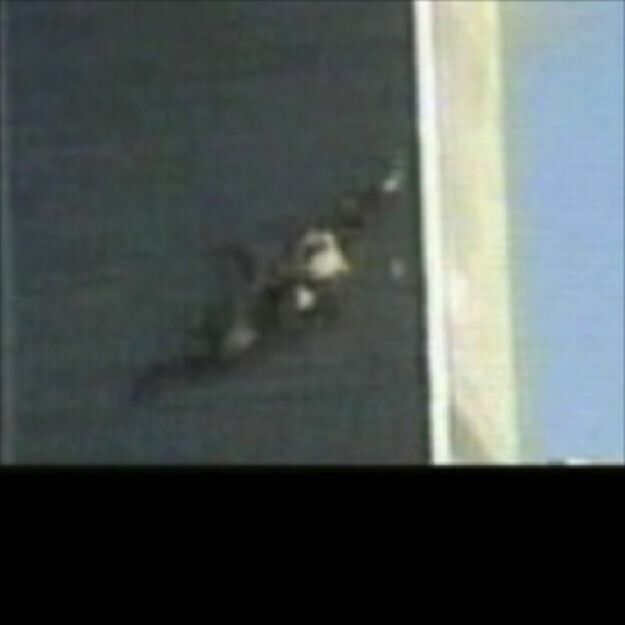 According to the official 9/11 story, this plane hit the South (WTC2) tower of the World Trade Center. This picture shows WTC2 right after a Boeing 767-200 supposedly hit the tower. Is this what you would expect to see if a huge plane going several hundred miles per hour smashed into a massive steel-framed building? 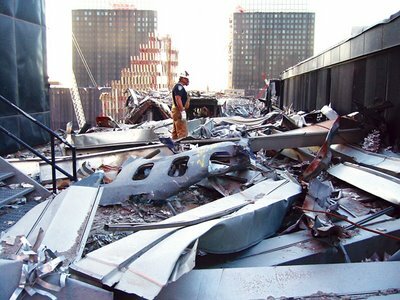 This picture shows the east face of WTC2 a fraction of a second after a Boeing 767-200 supposedly hit the tower. The plane supposedly hit on the left side of the picture, but notice how there is no fireball developing where the plane hit. The only fireball is forward and to the side of the entry site. Is this what you would expect if a 767-200 with wings full of jet fuel smashed into thick steel columns of a massive steel-framed building? Would you expect the wings to stay intact and then only dump and ignite their fuel once inside the building? 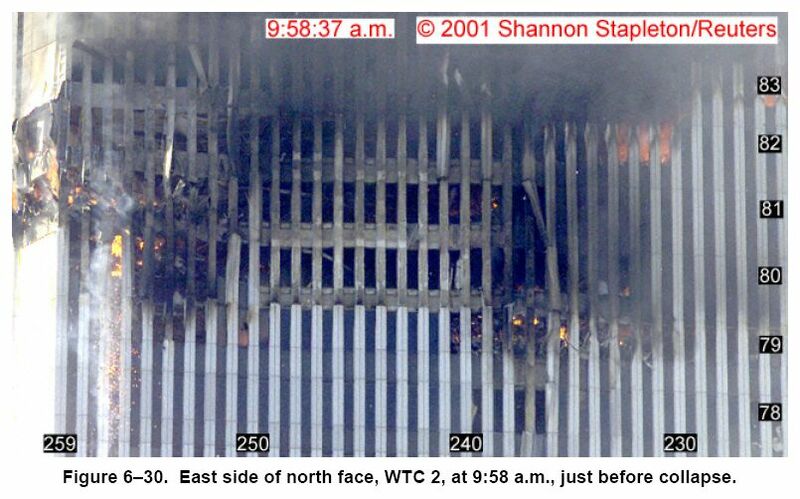 This picture shows the face of WTC2 where the Boeing 767-200 supposedly entered, the south face. Do you see any plane wreckage? 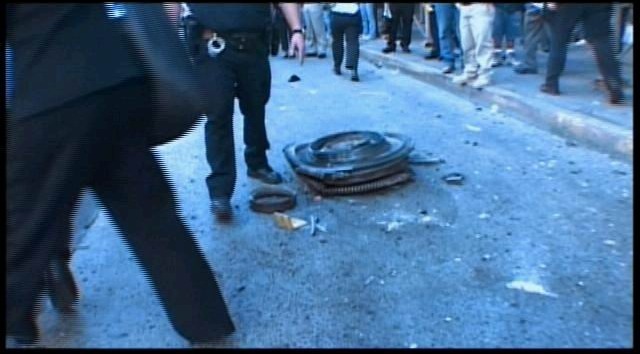 Do you see how a huge plane could have gone in this hole which is blocked with building debris? Do you see where the huge tail of the plane went into the building? What happened to the tail? There are no signs of it breaking off. 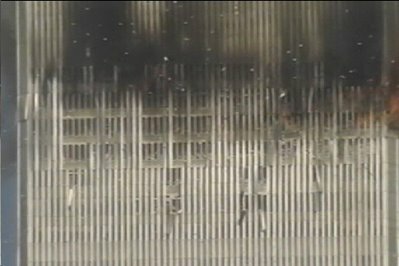 Here is the other side of WTC2 from where the plane officially entered, the north side. 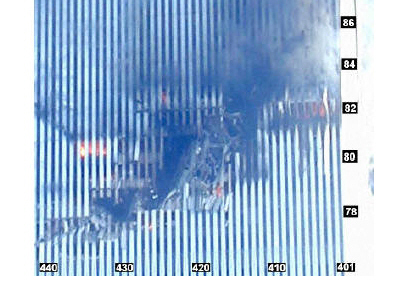 Do you see where the plane exited the building? Do you see plane wreckage piled up in the windows? Do you know how an aluminum plane can make a cut-out silhouette shape of itself in a massive steel-framed building then completely disappear inside a building only slightly wider than the plane? Here is the east side of WTC2-- the same place where much of the fireball erupted. Do you see plane wreckage piled up in the windows? A bunch of the aluminum cladding is knocked off, but no outer columns are severed. How could the plane be so powerful to knock a large hole in one side of the building and then not break any outer columns on this face? From the 159 foot long 150 ton plane, we have debris that adds up to less than half a percent of the plane. Where are the seats, luggage, wings, landing gear, tail, other engine and rest of the fuselage? How much of a plane was actually recovered from Ground Zero? 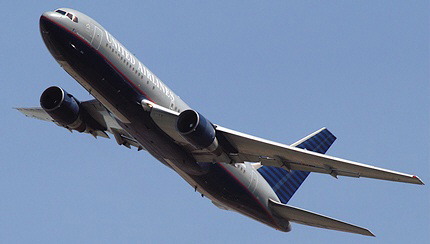 Did you find the Boeing 767-200? Can you still defend the official version of events? Well done! Remember to get in touch with master of illusion, David Copperfield. He'll be glad to hear from you! 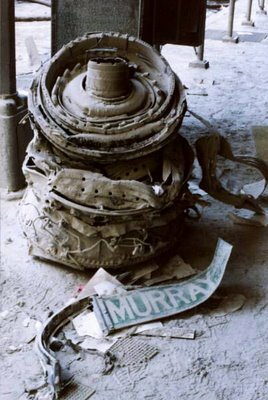 If you found the official version lacking in something (like a Boeing 767-200, for example): if you begin to question whether a Boeing 767-200 really did crash into the WTC2 tower then, no doubt, you'll be wondering what happened to the aircraft that disappeared. You will probably ask yourself why the US government even told you this story in the first place and you'll start asking yourself lots of other questions besides. Don't worry! This is perfectly normal! Please also see "Hunt the Boeing II: Shanksville Edition" for more Boeing hunting fun! You are kidding. Right? I'm guessing that you are using this theory to further your anti-war cause, as such a far-fetched claim will garner more attention than a simply cry to end the occupation.